You can think of smart audiences as a group of segments from your customer and subscriber base. Identifying these audiences allows you to intelligently target groups with different messaging or campaigns to resonate with those groups based on what you already know about their behavior and interaction with your brand. Retailers often experience a disconnect and missed opportunity in the way they market to their list. We typically market to active, engaged customers (which may only represent a small percentage of the list), while ignoring a huge segment of the list: non-buyers. This is only one example of an oftentimes neglected segment. Before you can use smart audiences, you must have purchased Advanced Retail Segmentation (ARS) or the advanced segmentation package. Also, ensure that you have conversion tracking turned on. 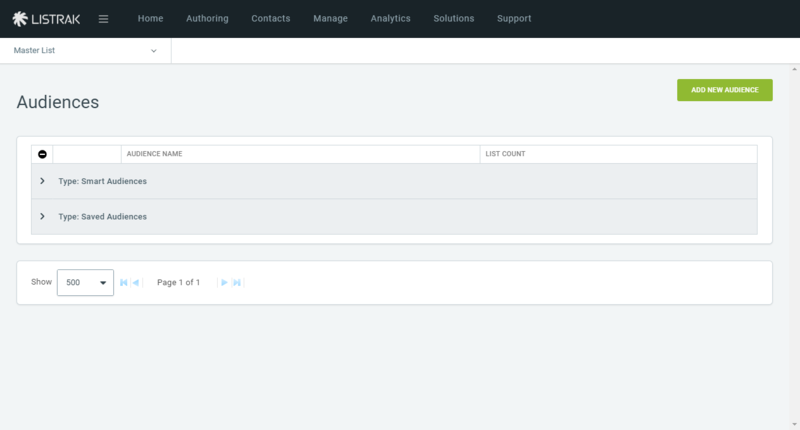 Follow the steps to do so in Enable Conversion Tracking. 4. 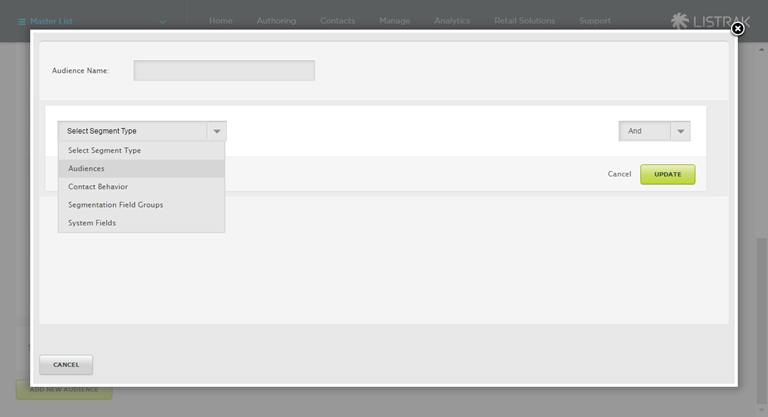 To view the available smart audiences and saved audiences (think saved segment), click the Expand icon. 5. Click Get List Count to view how many contacts are listed in each audience. 6. 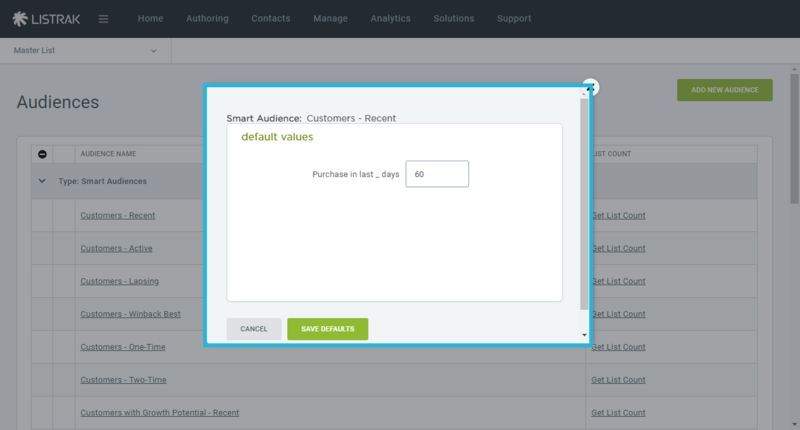 Customize the settings in the smart audiences to suit your individual business needs by clicking on the underlined Audience Name. In the below example, we can define "Recent Customers" as those who have purchased in the last 30 days, rather than the default value of 60 days. 8. 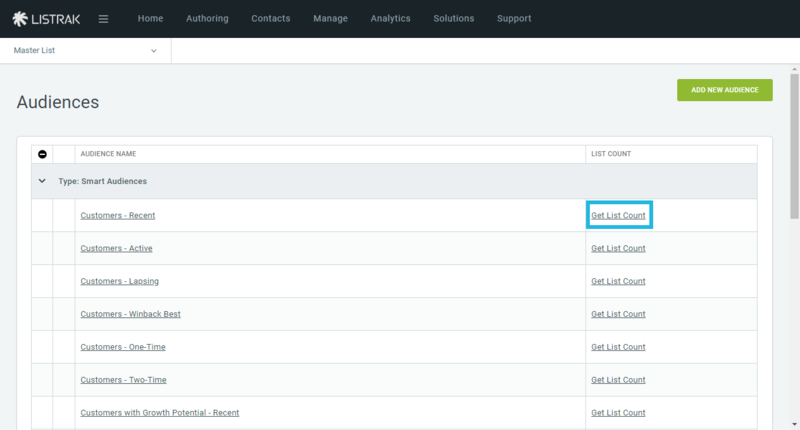 Lastly, you can create a completely custom audience if needed by clicked Add New Audience and selecting filters much like you would previously have done for saved segments. WHICH SMART AUDIENCES ARE AVAILABLE? 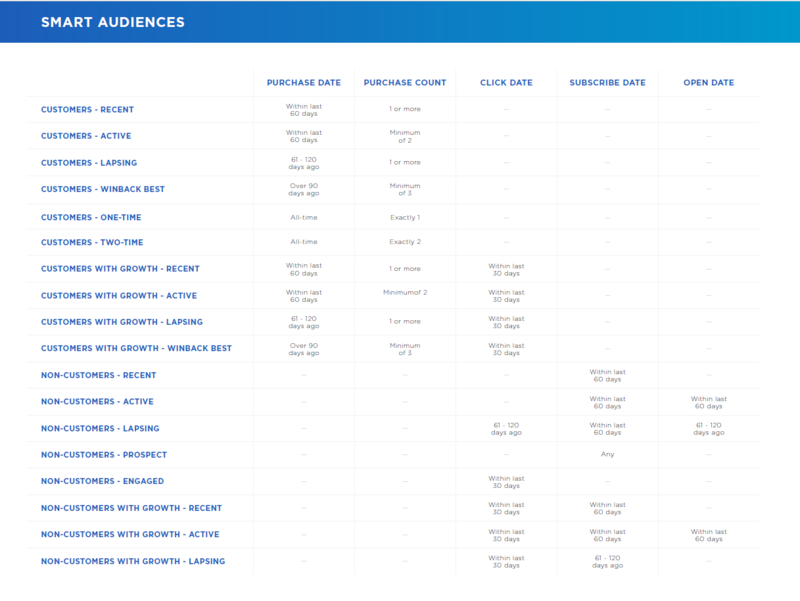 There are many separate smart audiences available for your use, as shown in the table below. However, this does not mean that you should create dozens of separate campaigns for each of these audiences. You can target a few at a time, or even combine several similar groups and send them the same messages. So what makes these audiences “smart”? Each audience was chosen based on targeting a business challenge that retailers face. Below, you'll find strategy examples for marketing to some of our favorite smart audiences. What should you do with this group? Simply put: convert them to buyers. Many retailers are disappointed when they look at their total list size and compare that to the number of actual customers on the list. We have identified two audiences of active subscribers with a high probability of conversion-- given the right strategy. This group has received your Welcome Series and potentially received an offer through that campaign. Obviously, that wasn’t enough to get the conversion at that time, so we have to get creative. STRATEGY TIPS: Test out offers that you don't typically present to your marketing list (gift with purchase, lower free shipping thresholds), test subject lines that call out their behavior “Today’s the Day! and if you have the option- utilize personalization to tailor the products included in the email to match their preferences and aid in new product discovery. This group has potential to become multi-buyers and eventually loyal customers. This group purchases once and only once, but if you convert even just a small percentage of them into multi-buyers, they are exponentially more likely to continue to make additional purchases in the future. STRATEGY TIPS: Deliver clear content to this group describing the value of continuing to purchase from your brand. Test subject lines that include some of the unique values your brand offers or brings a spotlight to your loyalty program to encourage additional purchases. Use personalization to key off of their recent browsing behavior and recommend similar products. Consider including an incentive with a sense of urgency expiration message. Bottom line: Earn trust and create a sense of immediate value for this group. You know this group represented a significant portion of revenue at one time, so they are worth the time invested in a targeted campaign to win back their loyalty-- and purchases. Your goal here is to keep these customers loyal to you as a retailer and prevent them from becoming a lapsed buyer. STRATEGY TIPS: It’s important to express your gratitude to this group through subject lines and content. Give them offers that make them feel special, if you can provide early access to a sale or some other version of exclusivity-do it! Support their experience with personalized content that ties to their previous purchases, like how-to’s, recipes or style guides. Facilitate a conversation between this group of individuals on social media- these are your advocates and it will make them feel good to know there are like minded individuals just like them out there. Use personalization to serve up the perfect products to fit their specific style. Because this may represent a large number of shoppers, this group still represents huge growth opportunity. There is a small window of opportunity when it comes to recapturing consumer attention to a level where additional conversions take place. STRATEGY TIPS: This group of customers deserves a series of emails that monitor how they respond to each message. If they do purchase, remove them from the conversation altogether. If they open or click without the conversion, alter the subject line in the following messages to indicate you’re paying attention. “Didn’t I just see you!” or “We meet again!” Use personalization and merchandising tactics to peak their attention-- things like new arrivals in their preferred brand or top rate products that match their shopping preferences. If you have room to do it, incentivize this group with a special offer that you repeat in every message throughout the series.